Hundreds of people participated in a moving mitzvah over two recent weekends at Congregation Beth Israel. The congregation, still kvelling over its architecturally lauded new building, celebrated the arrival of a new Torah scroll, which was completed by members of the congregation with the help of a sofer, a Torah scribe. 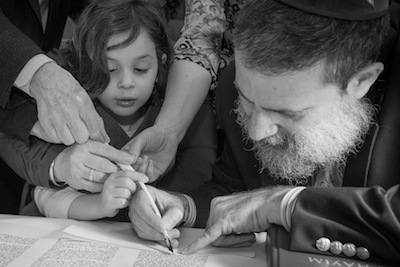 The new sefer Torah was scribed in Israel, with the final 100 letters to be completed. A lottery was originally planned by the congregation to allocate the honor of scribing a letter, but a compromise was found to give the opportunity to everyone who wanted to participate. “We asked if people would mind partnering with other families,” said Beth Israel’s Rabbi Jonathan Infeld. “And, despite the fact that we had 150 families or individuals who asked to participate, we had enough people who said they were willing to partner that everyone who asked to participate was able to do so.” In the end, about 600 people had a part in the process. Participants had the opportunity to scribe with the guidance of Rabbi Moshe Druin, one of several “traveling sofrim” associated with a Florida-based enterprise called Sofer On Site, which facilitates events just like the one Beth Israel chose to undertake. Druin also helped complete a Torah scroll for Temple Sholom last year. Each participant at Beth Israel proceeded through a variety of meaningful activity stations leading up to the scribing. Led by a volunteer guide, participants learned from teachers on a subject from the Torah. They then proceeded to a different area where they could decorate the new Torah binder, write a wish for the wishing tree, listen to storytelling or peruse the book corner. After handwashing, they prepared for the scribing, which they did with Druin. The sofer shared a teaching on the significance of each Hebrew letter and he filled in the letter as participants placed their hands on his hand or on the quill. After the scribing, the Torah was dedicated on Shabbat the following weekend, when the congregation also celebrated the 10th anniversary of Debby Fenson’s role as ba’alat tefillah, Torah reader. Fenson carried the Torah into the sanctuary and a music-filled procession welcomed the new scroll. 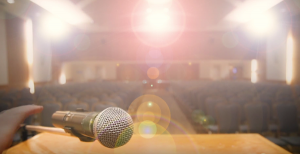 “We sang and walked the Torah around the entire shul so that everybody could see it and kiss it,” said Fenson, who admits that the dedication and surrounding ceremonies had a powerful effect on her. The Torah dedication was a first for both Fenson and Infeld. All of the synagogue’s existing Torah scrolls are more than 100 years old, said Fenson, so this was the first time a sefer Torah had been created specifically for the congregation. When the new synagogue was completed in 2014, the Torahs were carried into the ark, but this was different, Fenson said.